Travel to this enchanting land where ancient cultures and remote, walled villages welcome visitors, and tribal peoples in small communal villages still live, dressing as their ancestors did thousands of years ago. It is the land of discovery..."Lucy" or "Dinkinesh", the oldest known human remains to be discovered were unearthed here in 1974. 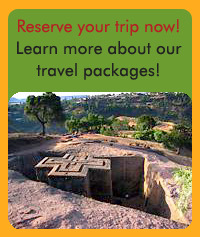 Travel by boat over Lake Tana, stopping at ancient monasteries, still overseen by monks, featuring vivid paintings from the 17th century and before. Visit beautiful Tissisat Falls at the headwaters of the famous Blue Nile River. Kayak, sail or fish for huge tilapia, Nile perch and catfish. Walk among historic churches, palaces, and stellaes, or obelisks, built thousands of years ago. Ethiopia is an excellent place for bird watching. with 861 diffferent species, 16 of which are endemic to the country. Try the delicious food so different from anything you have ever experienced. 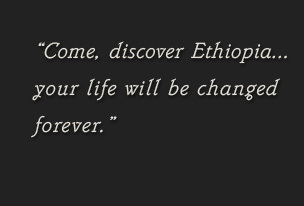 Come, discover Ethiopia ... your life will be changed forever!